Location, Location, Location - excellent two bedroom self catering apartments by, beside and looking directly onto Edinburgh Castle in the historic Old Town area of Edinburgh city centre. Each apartment provides views over the city and as Edinburgh Castle and other buildings in the surrounding area are floodlit in the evening it provides an ever changing outlook from these apartments throughout the entire day. 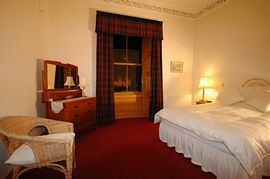 These two bedroom apartments provide excellent self catering accommodation which enables our guests to enjoy all aspects of their stay and with the likes of Edinburgh Castle, Camera Obscura, Tartan Weaving Centre, Scotch Whisky Experience, The Hub. Gladstones Land and the Writers Museum to name but a few attractions literally on the doorstep, it gives our guests the opportunity to explore the city as and when they would wish plus be able to relax in comfortable surroundings. Being surrounded by Edinburgh Castle and the very popular Royal Mile, Castlehill, Lawnmarket, Victoria Street and Grassmarket, these apartments are close enough for such places to be enjoyed but far enough away to avoid the noise etc experienced in these busy streets at all times of day and night. Our apartments have been fully refurbished, providing modern facilities however retaining traditional features including ornate plaster ceiling cornices, exposed woodwork with working shutters. The interiors are extremely comfortable and have a tasteful mix of antique and modern furnishings to enhance your stay. Each apartment as a large livingroom / diningroom having three large windows one of which faces directly onto Edinburgh Castle and the other two windows looking onto Johnston Terrace. 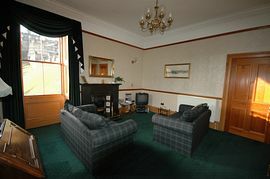 The apartments have a double and a twin bedroom which are fully carpeted, and either look directly onto Edinburgh Castle or have panoramic views over the Old Town city centre. 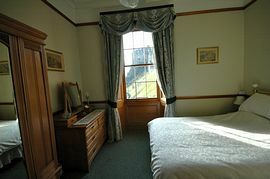 Each bedroom can sleep up two persons and there is a baby cot freely available if required. There is a tiled bathroom with shower screen/shower over the bath, heated towel rail and dual voltage shaver points. Fitted kitchens provide storage and food preparation space however for those guest wishing to dine out there are, nearby or a short walk away from the apartment, numerous world class restaurants, plus cafes and bars offering a wide choice of cuisines and a wide variety of night life. Also nearby and within walking distance are numerous attractions, historic buildings, galleries, museums, places of interest, shops and theatres. Many Guided tours and walks including Ghost tours are also available near the apartments plus there are many walkways and historic �closes� to explore at your convenience. Edinburgh Jazz and Blues Festival (July / August). Edinburgh International Festival of Music and Dance, Christmas/New Year activities 'Hogmanay' Celebrations. All city centre Bus Tour have designated stops in Johnston Terrace near the apartments. Having both the Bus Station and Waverley Train station only a short walk from the apartments it gives our guests the opportunity should they wish to travel outwith Edinburgh, however there are a short distance from the apartment, a number of organised bus tours offering a wide variety of day / part day trips outwith Edinburgh. Parking is free in Johnston Terrace between 6.30p.m and 8.30a.m and all day on a Sunday. There are pay and display parking metered bays available both across and down the street from the apartment. Alternatively there is a multi- storeyed car park in Castle Terrace at the foot of Johnston Terrace. 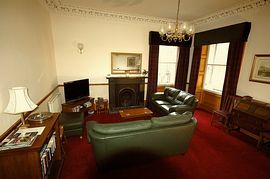 As our apartments provide ideal accommodation in excellent locations it enables our guests to explore Scotland's Capital at anytime, however should they wish they can relax, appreciate and enjoy the homely comfort each apartment provides. By, beside and with direct views to Edinburgh Castle. 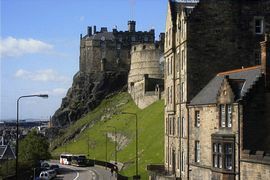 Local Services: Surrounded by Edinburgh Castle, Royal Mile, Castlehill, Lawnmarket, Victoria Street and Grassmarket with the Camera Obscura, Tartan Weaving Centre, Scotch Whisky Experience, The Hub, Gladstones Land and the Writers Museum to name but a few attractions literally on the doorstep. From £420.00 - £1,540.00 per week. 3 night stays from £240. Open all year for short breaks with minimum stay 3 nights.